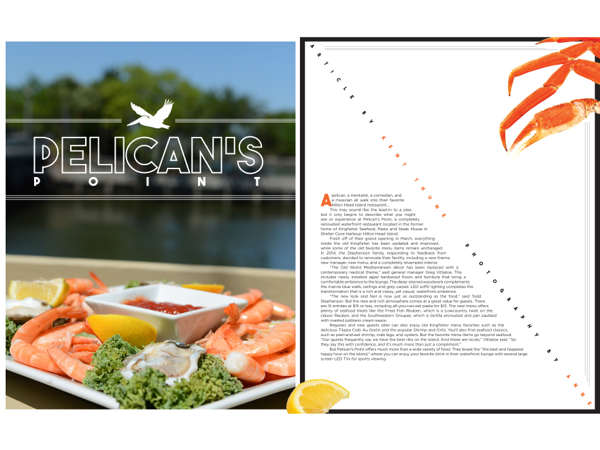 This may sound like the lead-in to a joke, but it only begins to describe what you might see or experience at Pelican’s Point, a completely renovated waterfront restaurant located in the former home of Kingfisher Seafood, Pasta and Steak House in Shelter Cove Harbour, Hilton Head Island. Fresh off of their grand opening in March, everything inside the old Kingfisher has been updated and improved, while some of the old favorite menu items remain unchanged. 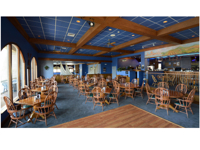 In 2014, the Stephenson family, responding to feedback from customers, decided to renovate their facility, including a new theme, new manager, new menu, and a completely revamped interior. “The Old World Mediterranean décor has been replaced with a contemporary nautical theme,” said general manager Greg Vittatoe. This includes newly installed aged hardwood floors and furniture that bring a comfortable ambience to the lounge. The deep-stained woodwork complements the marine blue walls, ceilings and grey carpet. LED soffit lighting completes the transformation that is a rich and classy, yet casual, waterfront ambience. “The new look and feel is now just as outstanding as the food,” said Todd Stephenson. But the new and rich atmosphere comes at a great value for guests. There are 15 entrées at $15 or less, including all-you-can-eat pasta for $13. The new menu offers plenty of seafood treats like the Fried Fish Reuben, which is a Lowcountry twist on the classic Reuben, and the Southwestern Grouper, which is tortilla encrusted and pan sautéed with roasted poblano cream sauce. 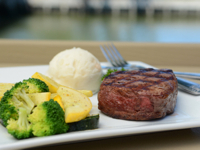 But Pelican’s Point offers much more than a wide variety of food. They boast the “the best and happiest happy hour on the island,” where you can enjoy your favorite drink in their waterfront lounge with several large screen LED TVs for sports viewing. They even added new technology for a greater customer experience. At each table is a “waiter call service button,” which when depressed, sends a vibrating call to the wrist watch of the table’s assigned server. Whether a guest needs a drink refill, condiments, the check or if they just have a question about the menu or anything else, they’ll get it when they need it. The service button also makes for better timing of the server’s table visits, which prevents the interruption of a special moment or a question that can’t be answered because you’re still chewing your food! This is a win-win for the guests and the server. When you finish your dining experience, you can go upstairs and be entertained at the Comedy Club of Hilton Head, located on the second floor of Pelican’s Point, in the “Pelican’s Roost” entertainment room. The Comedy Club continues its five-year tradition of hosting nationally known stand-up comics. As both a featured entertainer and the emcee of Comedy Club of Hilton Head entertainment, Bill Gladwell leads an all-star lineup of professional comedians who come from all around the country and have performed on HBO, Showtime and Comedy Central. The newly painted main dining room boasts floor to ceiling windows for a water view of Shelter Cove. Gladwell, also known as “The Mentalist,” grew a name for himself in Gatlinburg, Tennessee performing an act using hypnosis, suggestion, psychology, directed awareness, and showmanship at the Iris Theater. “It’s never the same show twice, because it’s interactive with the audience, which makes for an unpredictable and entertaining experience for the guests,” Gladwell said. His show was consistently rated number one out of a range of 50 acts in Gatlinburg. Now he is resident entertainer throughout the year performing his show several evenings each week. The Club is comfortable and accommodating with seating for up to 90 guests, providing everyone with a terrific seat. There is a service bar and light menu just for patrons of the club. The entertainment starts every night at 8 p.m. The club’s schedule and rotation of entertainers can be found at PelicansPoint.com and HiltonHeadComedyClub.com. Tickets are $18 for general seating and $22 for VIP seating (prices may differ for special engagements), with no drink minimums. For a complete night of food and entertainment, you can save 10 percent on dinner and the show by taking advantage of the Dinner/Show and Comedy Date Night packages. You can conveniently book tickets and choose seating online or pay at the door. To complete the entertainment package at Pelican’s Point, you can dine by the dance floor and check out a combination of live soft rock, jazz, and blues every Wednesday, Thursday and Friday, with different music each night. Pelican’s Point Restaurant is located at 18 Harbourside Lane, Shelter Cove Harbour, Hilton Head Island. For more information, call (843) 785-4442 or visit Pelicanspoint.com. Find out more about the Comedy Club at ComedyClubofHiltonHead.com. Reservations suggested.